Looking for a high-powered — but efficient — lighting solution that requires minimal to no maintenance? Look no further than Light Efficient Design’s PAR38 Recessed/Spot/Flood with 45 Degree Beam angle. You can use this solution with 6” or 8” recessed cans, making it great for a variety of applications and saving you money on new fixtures. 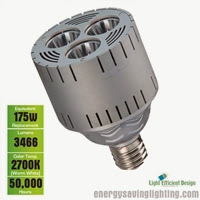 This LED PAR lamp is ideal for replacing incandescent bulbs up to 175 Watts, meaning that it will provide plenty of lighting for your space — all while consuming only 50 Watts of energy. With its 50,000 hour lamp life, you can expect this bulb to save you money time and time again, helping you save on maintenance costs, replacement costs and energy costs. At Energy Saving Lighting, we’re proud to offer this bulb for a great price and free shipping, so we can help you save even more money. Have questions about this lamp? Let us know in the comments below! We’d be happy to help you find the perfect bulb for your specific needs. 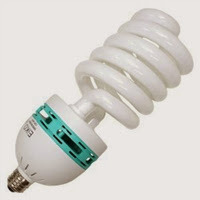 The Green Movement caused many people to switch from using incandescent bulbs to fluorescent bulbs. These compact fluorescent lamps (CFLs) have many more advantages compared to incandescent lamps: They take up less energy, live up to ten times longer and can save you up to $30 per bulb in energy costs. However, it is extremely important to dispose of CFLs properly, and the only way you can do so is by recycling. Each broken fluorescent lamp releases a small amount of mercury into the environment. Considering that about 670 million fluorescent bulbs are discarded – not recycled – every year in the United States, this amount of mercury exposure can be extremely toxic to humans and other living organisms. Long-term illnesses like permanent nerve and kidney damage can come hand-in-hand with the introduction of mercury into the environment. Environmental Responsibility. The green movement promotes the idea that we each hold the responsibility to keep the Earth in good condition. This includes being less wasteful and reusing the resources that are salvageable. Essentially every part of a fluorescent bulb is recyclable. You may not have a choice. Each state may hold its own specific regulations on recycling CFLs. Confirm your state or local government’s requirements with your local waste collection agency. Do not break the bulbs. Fluorescents are only dangerous when broken, so make sure to move them to their containers carefully without dropping them. If they happen to break, pick up the pieces wearing protective gear over your entire body and thoroughly ventilate the area. Pack them properly into the right containers. This step is important to ensure that the bulbs don’t break. Wrap each bulb in a padded material like bubble wrap, or put them inside their original casing. Then place the wrapped fluorescents in a box. Figure out where to send or drop them off. Use the Recycling Center Search to find the nearest recycling location for you. As a supplier of fluorescents, we offer a prepaid recycling program to make recycling easier for you. The cost takes care of everything from start to finish — simply ship the prepaid box out once it’s full! Take a look at the many different sizes and options of our lamp recycling containers here.